Slimming World has been a big part of our family meals for a year now, myself and Ian are members, both wanting to lose a few stone. We have found that we are both currently stuck at our current loss. I am currently stuck around the 3 stone loss, I will attend weigh-in and have put on 1-2lbs or get told I’ve either maintained or lost 1-2lbs, admittedly we are now very frustrated/bored with being stuck at this weight. 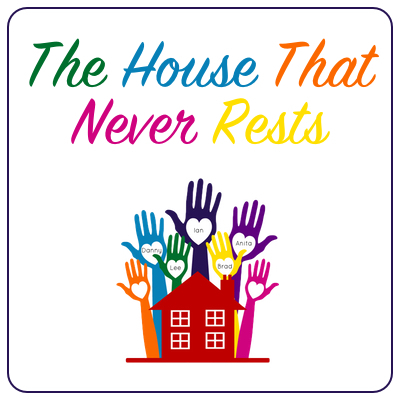 Ian does shift work and is unable to attend every week so his gains or losses are much bigger, he is currently stuck at the 2 stone loss. We have recently had a chat and have decided we want to try different meals to see if that helps boost our losses, we have decided our breakfast this week is going to be the first to change and will be Overnight Oats. We have been trying Overnight Oats so far this week and have found them to be so filling that the picking between meals had stopped (bonus). We also like the fact that it is a breakfast that you prepare the night before so it is also a time saver in the morning, you just get it out the fridge ready-made and ready to eat, you can eat it at home or simply grab and go (perfect). We washed and sliced our strawberries, measured our oats out, chose our yogurt and then was ready to make our breakfast. 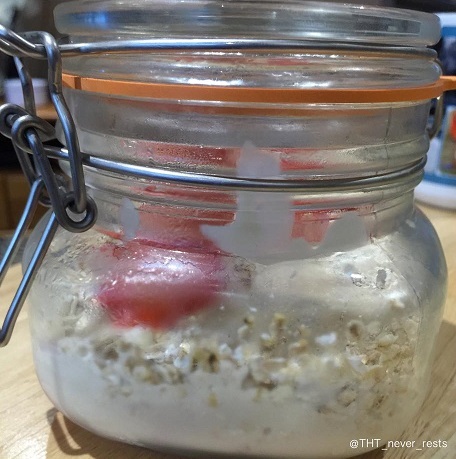 We covered the bottom of our glass jar with strawberries, spread one tablespoon of yoghurt over the strawberries, we then added some of the oats, enough to cover the yoghurt. 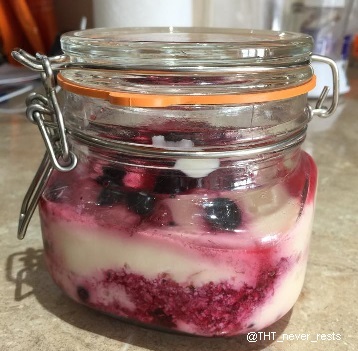 The process was then repeated, we continued to layer our ingredients until the ingredients had gone, we did not mix the ingredients together we left the oats to soak in the yoghurt and the fruit as it was layered. 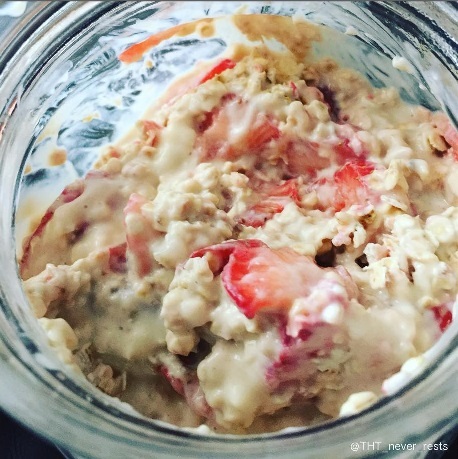 Once the Overnight Oats was made we then put it in the fridge until breakfast (10-12 hours). We then mixed the ingredients together then added some more fresh fruit on the top. This is what ours looked liked once it came out of the fridge the next day. This looked amazing, we couldn’t wait to tuck in. The ingredients above is per person. You can also add different fruits. 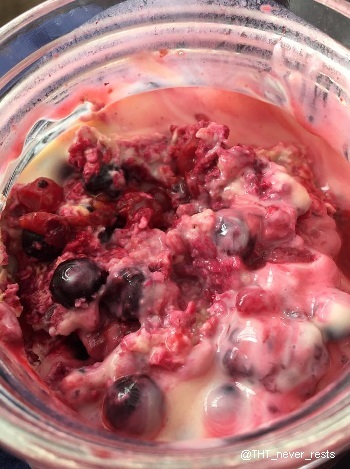 This is our mixed berries Overnight Oats. We will be continuing to make our Overnight Oats and will also be trying it using different fruits mixed in. 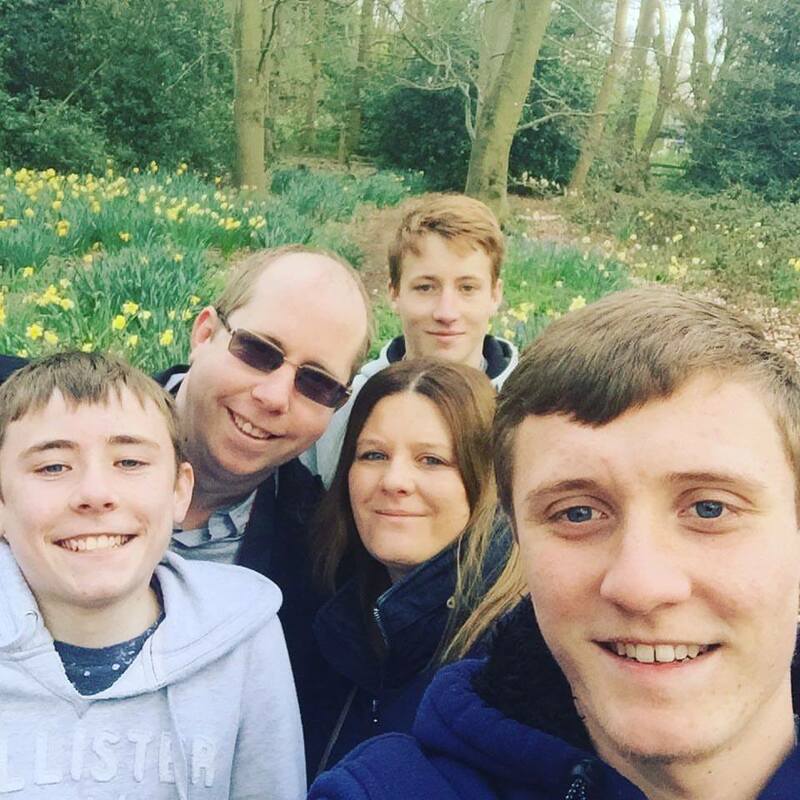 We will also be getting more active, we are going to take up swimming again and getting out more on our bikes. Do you attend Slimming World? have you been wanting to join? Please do come back a let us know if you give the Overnight Oats a try, we’d love to know your thoughts. I am on week one of my diet, one thing I have been doing is looking at our family meals and yes I admit we was not eating very healthy, but all that is to change from now on, we will have the odd naughty meal but only on the odd occasion here and there. 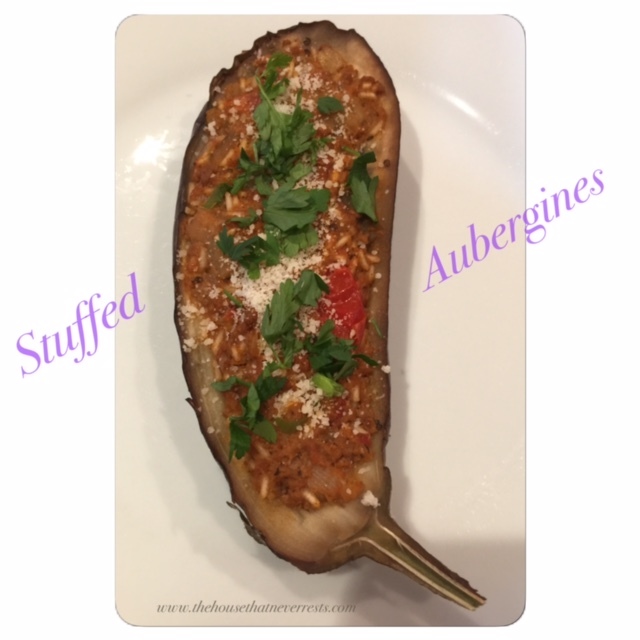 Tonight I have made stuffed aubergines, I will admit I have never cooked with aubergines before and wanted to give it ago and introduce it to my family meals. 150g extra lean minced beef. 3 vine tomatoes, chopped small. To start with I put the two aubergines in the oven whole and baked for about 15 minutes to soften them, I then left them to cool. Once they was cool I cut them in half horizontally, I then scooped out the middle and put the middle to one side ready to add to the mince shortly. I then browned my mince and drained away the fat. I then added the garlic, onion, tomatoes, the middle of the aubergine, oregano, passata and a pinch of salt and pepper. I left the mince simmering with the ingredients in a saucepan uncovered for about 10 minutes while I cooked the rice. Once the rice was cooked I then added the rice to the mince and vegetables and mixed it well. Once I had added the rice I then added the mixture to fill the aubergines, covered with foil and baked in the oven at 200c removing the foil for the last 5 minutes. Once cooked I dished up and garnished with freshly chopped parsley and we had this with side salad and a stuffed mushroom. The stuffed aubergines was enjoyed by all of us, the kids even asked for more and if we can have this again another day. So it was a big hit with them and a thumbs up all round, this will now be on our new family menu.